Dimensions 0.75 by 7.50 by 10 in. Any organization s key accounts are its lifeblood. They must be won, cared for, nurtured and protected. But do you know who your key accounts are, what they want and how they view you? Does your whole business practice key account management or are you just selling? Key Account Management provides you with a set of practical tools that show you how to: * Identify Your Key Accounts; * Implement A Strategy For Winning And Keeping Them; * Deliver Added-Value Propositions With Appropriate Rewards; * Keep Them Out Of The Grasp Of Competitors; * Develop Relationships That Are Mutually Beneficial.Included in this fully updated second edition of ""Key Account Management"" is a free CD ROM containing tried and tested key account identification and selection software, and a framework for writing your key account plans. 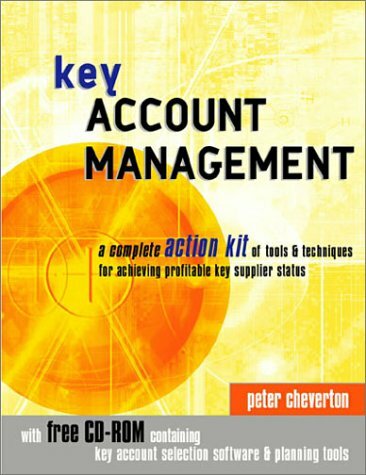 3 pap/cdr edition from Kogan Page Ltd (March 1, 2004); titled "Key Account Management: A Complete Action Kit of Tools and Techniques for Achieving Profitable Key Supplier Status"
About: Any organization s key accounts are its lifeblood.